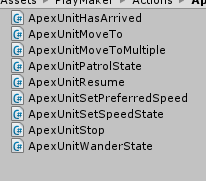 I started making some actions for Apex Path. I noticed the previous developer, who worked on the same type of actions, did not finish what he started. I am wondering if you guys had any more suggestions that you would like implemented for this asset. Let me know if you want to put them on the Ecosystem for easy distribution. Any updates on this I am very interested.